Entity Framework 4 Code First CTP4 was released in July and the API for developing without any edmx continues to mature and get better. Code First allows you to define your entity framework configuration with a Fluent API similar to Fluent NHibernate. Although the API for EF Code First is very user friendly, you should still have integration tests to verify that you've configured your entities correctly. This post will walk through configuring EF4 Code First optimistic concurrency. Notice on line #8 I have a byte array that I've named Timestamp. I'm going to map this to a SQL Server timestamp column. First I'll create my DbContext. DbContext is a new type in EF Code Only that simplifies ObjectContext to streamline on the most frequently used methods. Now anytime I need a database context, I can just call my factory method. Before we get to integration testing our data access code, let's wrap up our EF code in a simple repository so our consumers don't need any knowledge of EF. In EF4 DbContext, the ObjectContext is a protected property. Hence, if you want to get at it, you have to do so in the context itself (i.e., I could not have referred to it from my repository directly). At this point, we're ready to execute our integration tests. To do this, I'm going to use MSTest with Fluent Assertions. Fluent Assertions is a CodePlex project that enables you to use a fluent-style API to more natural specify your expected outcome. The API for MSTest has been basically stagnant for the last several years and this adds functionality onto it so you can use MSTest and still get the benefit of fluent assertions. Additionally, Fluent Assertions enables us to get away from the clumsy [ExpectedException] attribute to a more deterministic xUnit-style ShouldThrow() API. Notice line #15 above – it shows a simple example of the Should().Be() syntax that Fluent Assertions gives you for MSTest. Next look at line #20 and #23. Here is see we are deterministically asserting that that specific line of code will throw the expected exception. This is much better than the [ExpectedException] attribute as that could give false positives given that any line of code in your unit test could potentially cause an exception. There are a couple of interesting things to notice in our EF Prof output. First, the WHERE clause on line #6-7 above shows what we'd expect with Optimistic Concurrency – that is, it looks at both the Id and the concurrency token column. The second interesting thing is that EF prof is showing a red alert bubble. When we click on this we see, "Transaction disposed without explicit rollback/commit". 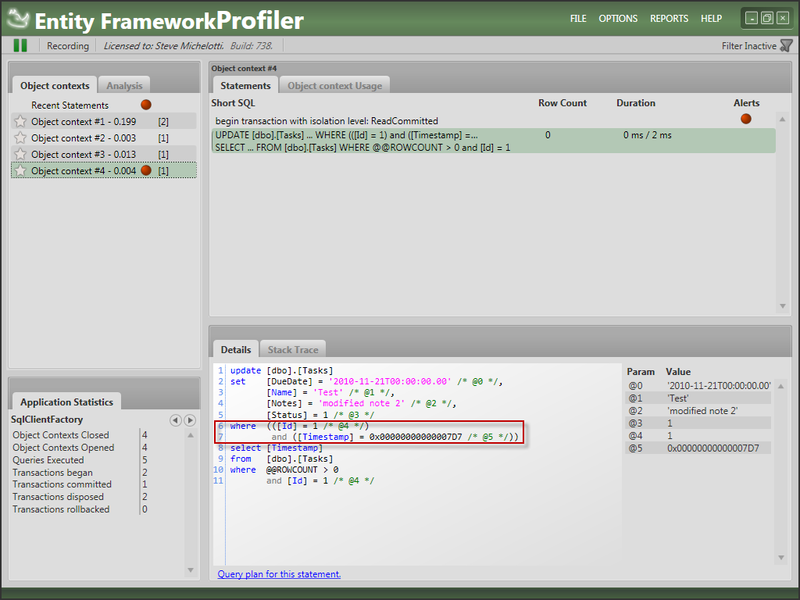 So EF Prof not only shows you the complete profiling results but also suggests ways to improve your code. Certainly data access code is nothing new. However, with EF4 Code First, integration testing with Fluent Assertions, and debugging with EF Prof, I must say, it's more fun than it's been in a while. I highly recommend checking all these out.